Levens, Levins, Levinz Levnze, and Leavens of Reading Vermont, Granville NY and Killingly Connecticut are the same often due to inaccurate municipal, military or stenographic court records. Surnames were in flux in England through the 18th Century compounded by record keeping in the New World. For example, Abraham Lincoln’s Family surname in Lincolnshire County England was spelled Linckoln. The first immigrant was John Leavens, 50 years of age in 1632, sailing from London, England with his wife on the William and Francis commercial vessel out of London. They disembarked at Roxbury, Massachusetts June 5, 1632. He was awarded less than 50 acres, suggesting he owed his passage to the company that owned the William and Francis; if you paid your passage and brought a servant you received 50-200 acres. He helped to establish the first public Latin School of Roxbury for all to attend. After his wife died in 1638 he married Rachel Wright, often scribed as White. His first born was delivered in December of 1640. They had six children including twins at his age of 63. John’s new wife conflicted with the rigors of Massachusetts law, consumed now by the Puritans of the Massachusetts Bay Colony, moved the family to the new village of Killingly, Connecticut where John had established a new farm. Killingly is also known as Putnam, Connecticut. James Leavens, John’s eldest son, was killed by Native Americans in the King’s Phillips War of 1675 at the age of thirty-five. Andrew Leavens, also John’s son, fought in the King Phillips war in Hadley, Massachusetts. He took the Hadley oath of residency furthering the Leavens trek west to the Connecticut Valley. We did not find a record of a marriage. John Leavens Jr helped settle Woodstock, Connecticut in 1686 with the appointment of 20 acres of free land. He succumbed to an illness in 1696. The Leavens original Roxbury, Massachusetts farm today is a landmark of the boyhood home of fallen Bunker Hill hero, General Joseph Warren, M.D., the last to die. a. A renowned Freemason and Son of Liberty. b. Joseph Warren was Paul Revere’s chief officer of the spy network managed by Paul Revere. c. Paul’s eleventh child, Joseph Warren Revere, was named after Dr. Joseph Warren. d. Joseph Warren Revere was the principal responsible for manufacturing the Tuscaloosa Bell. Through marriage and recording errors the family tree of John Leavens has spun one-hundred and thirty-two known Surnames and seventeen generations by the 20th Century. Other Leavens settled in Putnam and Belpre, Ohio, Oxford, Mansfield, Roxbury, Massachusetts, Coventry, Connecticut, Alexandria, Virginia and Indiana. Philo French Leavens’ genealogy book of 1902, listed 130 ancestors of Leavens living or dying in Mobile, Alabama. Joseph Leavens, was a Justice of the Peace for Windsor County Ct, circa 1725. Fostered eight daughters that married and substantially extended the family tree. Joshua’s ancestors appealed and established their own meeting house in 1746; the principals were Joseph Leavens Senior, Noah Levinze, Benjamin Leavens, James Leavens and seventeen others. This activity was part of the “Great Awakening” from Puritan/State theology that began in 1692. Peter Leavens, left a broken home in 1745, sold his land in Killingly and established a family in Duchess County NY. Peter adopted the Quaker faith, possibly as he married in 1745. Abel, Noah and Peter Leavens, above served in the French and Indian War of 1754-1763. Peter’s last name was spelled differently with each change in his regiment. Darius Leavens and his platoon of eight militiamen were nearly the last to retreat from Bunker Hill (Breed’s Hill) June 17, 1775. Jedidiah and Charles Leavens stood with Washington at the battle of Manhattan, November 16, 1776. The list of Leavens serving throughout the War of Independence is extensive. 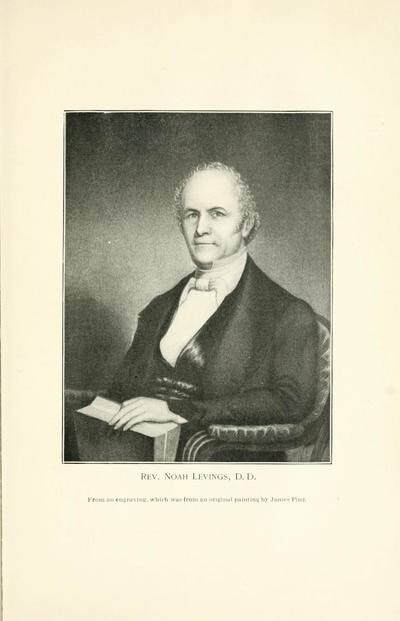 Noah Levings of NYC, Doctor of Divinity, son of the soldier Noah, born in New Hampshire. a. Apprenticed as a blacksmith at the age of sixteen in Troy, NY. b. His image is to the left and his Biography available on pages 109-110 of "The Leavens Name" See Endnote for a web link. c. Noah joined in 1813, licensed as a preacher at the age of twenty-one. d. He sought a different approach to worship. The fifth church that he visited brought him to the Methodist Episcopal place of worship. ​ c. Sally White 1849 to 1902 prox. Samuel St John Jr was a descendant of Mathias St John of Dorchester Mass, immigrating in 1634. Mathias was the Latin pronunciation of Matthew. Mathias moved to Windsor, Connecticut in 1640, Wethersfield, Connecticut in 1643 and Norwalk, Connecticut in 1654. The family name was recorded in New Canaan, Connecticut as Seation in the town records of 1706. Before this, town documents used the surname of Sensions. 5. George B, St John lived in Mobile until 1904. Born 12/4/1852, married Josephine C Wilson, of Salem VA, 10/17/1789. 6. Orline St John Alexander, the family biographer, published a history of the St John’s in 1902 in New York City. It covers 1634- 1901 And is 624 pages. See our bibliography for an online link to his book. ​ 7. In the twentieth Century, the St Johns’ had branched out to Venezuela, Urbana Illinois, and Spokane, Washington. Revere Family records of the 1828 bell(s), delivered. Back to Joshua B. Leavens and St John Jr, Tuscaloosa bell donors.